It is the city's third military cemetery. The first had been the old graveyard on Portland Street (Victoria Square) whose use from 1794 to 1863 has been well documented by Michael Rudman. (2) By 1863, however, it was full and no further burials were permitted. The last soldier laid to rest at Portland Street may have been James McQuarrick of the 63rd Regiment, who passed away in late April 1863. (3) When Sgt John Taylor of the 30th Regt. of Foot died on 19 June 1863 he was buried instead in the Necropolis, a public cemetery. (4) Presumably, the choice of a location for the new cemetery had not yet been approved. Then, for a second time within four months, the military authorities had to pick a new burying ground. By mid-October, 1863, the lands on the east side of Strachan Avenue had been chosen and guidance was being sought from religious leaders on how to deal with the few burials in the second cemetery. (9) In early November Toronto City Council was asked if it had any objection to the opening of another military graveyard. (10) By the latter part of December a number of coffins had been moved to the new place. (11) The remains of Pte Walsh were among those transferred, since a gravestone bearing his name survives in the Strachan Avenue cemetery today. Unfortunately, no register of burials pertaining to the cemetery is known to exist. Hence, the information needed to compile a record of people interred there has had to be drawn from inscriptions on the markers that survive, from newspapers, regimental returns and archival records. The result is a list of 97 soldiers, veterans, their wives and children who died between 1862 and 1911. (Appendix A) A majority died from natural causes like asthma, consumption and aneurisms, but significant numbers drowned. (Appendix B) Most burials took place before 1870, when the British army turned Fort York over to the Canadian military and returned home. The religious affiliations of about forty-two are known: thirteen were Roman Catholic, nine were members of the Church of England, while the rest were "Protestant" or were buried in the Protestant part of the cemetery. This list is incomplete, since none of the documentary sources examined reported routinely on the deaths of soldiers' wives and children. Yet, as Michael Rudman has shown in his analysis of the Burial Record for the Old Garrison Burying Ground between 1825 and 1850, the number of adult females and children laid to rest there during that period (122) slightly exceeded the number of men (118). (14) Applying these ratios to the number of soldiers known to be buried in the Strachan Avenue ground (75), it follows that some 76 women and children may be interred there, though only 22 are known by name. In total, therefore, the cemetery may contain about 150 graves. However, this number falls short of the approximately 200 graves John Ross Robertson said were there in 1888 after he counted the mounds of earth. His statement might be thought excessive but is corroborated somewhat by a memoir written about 1910 by a anonymous veteran who had served at Fort York in the 1860s. (15) The latter said that in 1863/4 a fatigue party from the 16th Regiment was assigned to help the military train transfer "60 or 70 bodies from Garrison Commons to Strachan Avenue, the men receiving 1s. 6d per day." Unless the old soldier erred in recalling that the second cemetery contained 60 or 70 burials, rather than only five or six, his account may explain the difference between the 150 burials extrapolated from known interments, and Robertson's count of 200 graves. More importantly, the 60 or 70 bodies he spoke of may have been the remains of soldiers who fell during the taking of York by the Americans in April, 1813. Pictures of the burying ground are rare. The earliest view, a pen-and-ink sketch made for John Ross Robertson in the 1880s, looks east across the cemetery towards Fort York. (Plate 1) A 1904 photograph was from a similar point of view. (Plate 2) Not reproduced here is a newspaper article of 1921 that was accompanied by a photograph of Hanney's and Walsh's stones. (22) The following year the City's Parks department prepared a sketch plan to illustrate a proposal to landscape the cemetery and assemble most of the stones in an artificial plot (Plate 3). This plot was depicted in a photograph taken in 1928 (Plate 4). A separate officers' plot containing four stones in good preservation was mapped on the sketch plan but does not show in the photo. It was left in situ until perhaps 1970. Probably the withdrawal of the British army from Canada in 1870 had something to do with the speed with which the ground became overgrown and neglected. Few relatives of those interred there continued to live in Toronto and were able to pressure the authorities into maintaining the cemetery properly. A campaign to restore dignity to the site was sparked by a 1921 newspaper article describing the cemetery's condition as pitiful. 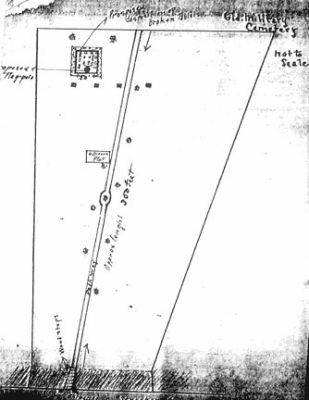 The following year the Parks Department was authorized to level the mounds, collect the broken tablets into a square plot at the east end, replace the iron bars missing from the fence around the officers' plot, construct a cinder pathway across the ground and erect a flagpole, as shown in the sketch plan. 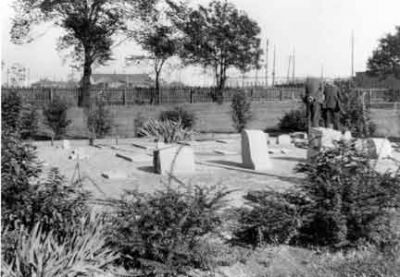 The IODE traces its interest in the Strachan Avenue burying ground to 1922, when it presented a bronze tablet that was unveiled by the Mayor on 11 November. The IODE has held a ceremony at the cemetery on Remembrance Day annually since 1952, in recent years in co-operation with Heritage Toronto. Charles Unwin, O. L. S., "Plan Shewing Exhibition Park and Garrison Commons," Toronto 12th Sept. 1906. Scale 150 ft. to 1 inch, Attached to grant of Garrison Common lands to City of Toronto, 17 May 1909. City of Toronto Archives [hereafter CTA]. Michael J. Rudman, The Old Garrison Burying Ground. (1794-1862), rev. April, 1997. Privately published. The Globe [Toronto], 28 April 1863, p. 1, c. 9. McQuarrick's remains were reported to have been interred in the cemetery attached to St. John's Church, Bathurst Street, leaving little doubt his resting place was the Portland Street graveyard. Globe, 22 June 1863, p. 2, c. 4. Globe, 9 July 1863, p. 2, c. 5. The Canadian Freeman [Toronto], 6 August 1863, p. 2, c. 1. Globe, 25 August 1863, p. 2, c. 7. Public Record Office, London [hereafter PRO]: WO/3372, Quarterly Returns for 16th Regt. of Foot. Lt. Col. George Peacock to the Rt. Rev. J. J. Lynch, D. D., 21 October 1863, (LAHO8.12); same to same, 26 October 1863 (LAHO8. 13), Archives of the Roman Catholic Archdiocese of Toronto [hereafter ARCAT]. The Leader [Toronto], 10 Nov. 1863. Globe, 19 Dec. 1863, p. 2, c 4. The Canadian Freeman [Toronto], 24 Dec. 1863, p. 2, c. 1. Mrs. Powell to W. D. Powell, 12 May 1813, Powell Papers, Toronto Reference Library. Jul 7 Pte James Walsh, 30th Regt. Aug 24 Pte John Mitchell, 30th Regt. Oct 21 Pte John Harlow, 16th Regt. Dec 28 Gunner Donald McTavish, 5th Batt, 10th Brigade, R.A.
Jan 25 Henry Smith, 5th Batt., 10th Brigade, R.A.
Feb 4 Pte James Henniker, 16th Regt. Feb 29 Pte Michael Murphy, 16th Regt. Mar 21 John McFee, 5th Batt., 10th Brigade, R.A.
Apr 1 Pte Myles Killegar, 16th Regt. Apr 9 Ensign J. Ramsay Akers, 16th Regt. Apr 23 Pte Cornelius Ryan, 16th Regt. Oct 18 Pte Joseph Walton, 16th Regt. Nov 12 Charles Henry Leslie, son of Capt. George Leslie, R.A.
Nov 22 Pte George Hyde, 16th Regt. Nov 28 Pte Christopher Toole, 16th Regt. Jan 18 Lance-Corp Thomas Eagan, 16th Regt. Feb 14 Michael McCarthy, "D" Batt., 4th Brigade, R.A.
Feb 16 Ellen Lehene, infant daughter of Sgt Jeremiah Lehene, 1st Batt. 16th Regt. Feb 20 Pte Patrick Gready, 16th Regt. Mar 12 Pte Daniel Carroll, 16th Regt. Mar 14 John Campbell, infant son of Serjt John Campbell, 16th Regt. Jun 3 Colour Sgt John Hanney, H.M. 47th Regt. Sept 10 Drummer John Shannaghan, 47th Regt. Oct 15 Elizabeth Carmody, infant daughter of Pte Thomas Carmody, 47th Regt. Oct 26 Pte Michael McCoy, Company E, 47th Regt. Apr 29 Pte Joseph Cocker, 47th Regt. May 20 Michael James Cahill, son of Michael and Mary Ann Cahill, 17th Regt. Jul 9 David Mills, "G" Batt., 4th Brigade, R.A.
Aug 2 Pte John Travers, 47th Regt. Aug 11 Pte Mark Buxton, 17th Regt. Oct 1 Pte Thomas Davis, 17th Regt. Oct 10 William Sudbury, "D" or Grey Battery, 4th Brigade, R.A.
Jan 3 Pte Thomas Croft, 2nd Batt., 17th Regt. Jan 16 James Ifield, driver, "D" Batt., 4th Brigade, R.A.
Jan 31 James Brown, labourer, "G" Batt., 4th Brigade, R.A.
Feb 15 William Smith, "D" Batt., 4th Brigade, R.A.
Apr 6 Pte Joseph Simkins, 17th Regt. Jun 14 Pte George Hutchinson, 17th Regt. Jul 17 — Fitzgerald, tailor, formerly 4th Brigade, R. A.
Jul 29 Pte Samuel Callaway, 17th Regt. Jul 29 Gunner Henry Robinson, "G" Batt., 4th Brigade, R.A.
Aug 9 Samuel B. Dummitt, infant son of Serj Samuel Dummitt, 17th Regt. Oct 27 Pte John Connell, 17th Regt. Nov. 29 Gunner F.D. Chapman, "F" Batt., 4th Brigade, R.A.
Dec 1 — Butler, infant son of Serj Alfred Butler, 2nd Batt., 17th Regt. Dec. 4 Gunner John Phillips, "F" Batt., 4th Brigade, R.A.
Dec 25 [Pte?] William Smith, "H" Batt., 4th Brigade, R.A.
Jan 30 Gunner Augustus Thomas, "F" Batt., 4th Brigade, R.A.
Feb 21 Daniel Maher, driver, "H" Batt., 4th Brigade, R.A.
May 29 Pte F.C. Mulcahy, 17th Regt. Jun 8 Pte Hugh Cannon, 29th Regt. Sept 27 Frances M. Jones, infant daughter of Serj-Maj and Agnes Jones, 29th Regt. Oct 6 Pte Richard Kilfoil, 29th Regt. May 20 Pte John Wilkinson, 29th Regt. Dec 20 —, aged 2 yrs. 4 mos. Dec 22 Pte Robert Connell, Royal Canadian Regt. Markers in varying states of decay survive for the names bolded below. In some cases the inscriptions cannot be read completely or with confidence. Transcriptions have been made on several occasions, first in 1922 by an anonymous reporter for The Telegram; then in June, 1953, by John A. McGinnis; and most recently in 1992 by J. Brian Gilchrist and William J. Patton. The readable portions of the inscriptions are reproduced in the endnotes. Underlying this list is an assumption that, unless there is evidence to the contrary, any soldier who was reported in his regiment's return to have died while on duty in Toronto was interred here. [Infant], died 20 Dec. 1893, aged 2 yrs. 4 mos. Telegram, 18 Dec. 1903, p. 3, c. 1. Public Record Office, London [hereafter PRO]: WO 12/3373, Quarterly Returns for 16th Regt. of Foot; Globe, 21 May 1864, p. 2, c. 5; ibid., 26 May 1864, p. 2, c. 5. A surviving marker is inscribed, "In memory of [J. Ramsay] Akers . . . [illegible]." Akers drowned with another soldier, Ensign B.O. Brownrigg, whose body was preserved, placed in a metallic coffin and sent to England instead of being buried in the Garrison Cemetery.PRO: WO 12/1132, Quarterly Returns for 13th Hussars; Globe, 6 June 1868, p. 2, c. 6. PRO: WO 10/2506, Quarterly Returns for "G" Batt., 4th Brigade, R.A. PRO: WO 12/1131, Quarterly Returns for 13th Hussars. Diocese of Toronto Archives, Anglican Church of Canada [hereafter ADTA], Records of St. John the Evangelist, Toronto, military death reports, 1867-69. PRO: WO 12/3490, Quarterly Returns for 17th Regt. of Infantry. Archives of the Roman Catholic Archdiocese of Toronto [hereafter ARCAT], Baprtismal Register for St. Mary's Parish, Toronto. A surviving marker is inscribed, "In Memory of / Michael James Cahill / son of / Michael & Mary Anne / Cahill / 47th Regiment / Born Aug. 11, 1865 / Died May 20, 1866 / Aged 9 months & 11 Days." PRO: WO 12/3491, Quarterly Returns for 17th Regt. of Infantry. A surviving marker is inscribed, "This stone was erected by armory Serjt. John Campbell / I.B. / 16 Regt. / In memory of his son / John / Who Died / Mar. [14?] 1865 / Ae. 1 yr & 9 mo's / Suffer little children to come / unto me and forbid them not for / of such is the kingdom / of Heaven." PRO: WO 12/4552, Quarterly Returns for 29th Regt. of Infantry. "Remember Dead of 1812," Telegram [Toronto], 11 Nov. 1922. PRO: WO 12/3373, Quarterly Returns for 16th Regt. of Foot. ARCAT, Baptismal Register for St. Mary's Parish, Toronto. Also, Leader [Toronto], 18 Oct. 1865, p. 2, c. 7; ibid., 19 Oct. 1865, p. 2, c. 6; ibid., 20 Oct. 1865, p. 1, c. 8. PRO: WO 10/2509, Quarterly Returns, "F" Batt., 4th Brigade, R.A. PRO: WO 12/5938, Quarterly Returns for 47th Regt. of Foot; Leader, 1 May 1866, p. 2, c. 5. A surviving marker is inscribed, "Sacred / To the Memory of / Margaret Youngest Daughter / of Col Serg. James Common / R.C. Rifles, who died on the / 31 August 1864 aged 1 Year / and 136 Days / The Lord gave and the Lord Hath Taken / Away Blessed be the name of the Lord." PRO: WO 12/3491, Quarterly Returns for 17th Regt. of Infantry; Leader, 27 Nov. 1867, p. 2, c. 8; Globe, 28 Nov. 1867, p. 2, c. 7. A surviving marker is inscribed, "In / Memory of / Pte. Robert Connell R.C.R. / Died / Dec 22nd 1911 / Aged 43 Years / Erected by his Comrades." "Remember Dead of 1812," Telegram, 11 Nov. 1922. A surviving marker is inscribed, "Jane / Beloved daughter / Henry & Anne [?] / Connarton [?]." PRO: WO 12/1132, Quarterly returns for 13th Hussars; ADTA, Parish records of St. John the Evangelist, Toronto, military death reports, 1867-69. Ontario Archives [hereafter OA], RG 80-10, #021494 (1890). A newspaper n article ("Remember dead," Telegram, Nov. 11, 1922), says Cpl James W. Beaty who died May 31, 1890, is buried in the cemetery. A search of death records for York County in that year turned up no record for James W. Beaty but did uncover one for Cpl James William Craig who died on that date. A footstone bearing the initials "JWC" is found in the cemetery today. PRO: WO 12/3490, Quarterly Returns for 17th Regt. of Infantry; Globe, 4 Jan. 1867, p. 2, c. 4; Daily Telegraph [Toronto], 4 Jan, 1867, p. 2, c. 9. Telegram, 1 Aug. 1905, p. 6, c. 5; Star, 1 Aug. 1905, p. 7, c. 5. A surviving marker is inscribed, "[In] Memory of Pte. / John Dobbie / No. 4438 / drowned / July 31, 1905 / Aged 33 yrs / [illeg. line]." "Remember dead of 1812," Telegram, 11 Nov. 1922. In 1953 McGinnis documented a marker inscribed, "Samuel . . . Aug 9 18 . . 1 yr 81 days . . . in this and . . . for until thy mother . . . in therein thy joy and to . . .17th Regt." Although the stone is not found in the cemetery today, likely it was the one that marked the grave of infant Samuel B. Dummitt. The spelling of the surname has been checked in PRO: WO 12/3490. PRO: WO 12/3373, Quarterly returns for 16th Regt. of Foot; Globe, 19 Jan. 1865, p. 2, c. 5; ibid., 20 Jan. 1865, p. 2, c. 7; Daily Leader, 19 Jan. 1865, p. 2, c. 8; ibid., 20 Jan. 1865, p. 2, c. 7. PRO: WO 12/5937, Quarterly Returns for 47th Regt. of Foot. PRO: WO 12/1132, Quarterly Returns for 13th Hussars. Daily Mail [Toronto], 14 Feb. 1885, p. 9, c. 2, p. 16, c. 1; "Landmarks of Toronto: The Military Cemeteries," Telegram, 4 Oct. 1888, p. 4, c. 4-5. A surviving marker is inscribed, "Sacred / . . . / [Sergeant-Major F.W. Gathercole / of the C School of Infantry] / at New Fort Toronto / Feb. 13th 1885; / Aged 42 Years / Erected / in affectionate remembrance by his Comrades." OA, RG 80-4, #019375 (1880). The existence of a small marker inscribed "FWG" that matches another inscribed "Walter" and is separate from Sgt-Maj F.W. Gathercole's monument suggests that F.W. Gathercole, Jr. is interred here too. PRO: WO 12/5937, Quarterly Returns for 47th Regt. 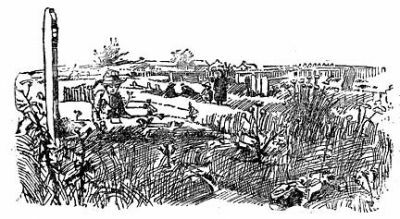 of Foot; "Landmarks of Toronto: The Military Cemeteries," Telegram, 4 Oct. 1888; Fred G. Griffin, "Old Soldiers in a Neglected Corner," Star Weekly, 20 Oct. 1921, p. 9, il. A surviving marker is inscribed, "IHS / In Memory of / John Hanney / of H.M. [47th] Regt / Died [3 June] / 1865 / Aged 36 yrs / This stone has been erected by his brother [Sergeants?]." PRO: WO 12/3372, Quarterly Returns for 16th Regt. of Foot, 1st Batt. OA, RG 80-10, Registration of Deaths, #020354 (1885). A surviving marker is inscribed, "Sacred / to the [Memory of?] / Private E.A. Heath / . . . April 2, 1885 / ... / Erected / in affectionate rem[embrance] / By his [Comrades]." PRO: WO 12/3372, Quarterly Returns for 16th Regt. of Foot. PRO: WO 12/1132, Quarterly Returns for 13th Hussars; Globe, 6 June 1868, p. 2, c. 6. OA, RG 80-10,Registration of Deaths, #020021 (1891). In "Remember dead," Telegram, 1922, Holding's rank is given as Colonel but in view of his age at death (20) he probably held a lesser rank. A footstone inscribed "H.H." survives. PRO: WO 10/2506, Quarterly Returns for "D" Batt., 4th Brigade, R.A.
A marker survives and is inscribed, "Sacred / to the memory of Frances M. / daughter of / Serg't Major & Agnes / Jones 29 Reg't / Who departed this life / Sept. 27, 1868 / Ae. 1 Y'r & 3 D'ys." It bears the stonecarver's name, N.L. Steiner. A surviving footstone inscribed "F? M.J." may be related. PRO: WO 12/4552, Quarterly Returns for 29th Regt. of Infantry; ADTA, Parish records of St. John the Evangelist, Toronto, military death reports, 1867-69. PRO: WO 12/1132, Quarterly returns for 13th Hussars; Globe, 12 Nov. 1868, p. 4, c. 1; ibid., 13 Nov. 1868, p. 1, c. 8; Leader, 13 Nov. 1868, p. 2, c. 8. ARCAT, Baptismal Register for St. Mary's Parish, Toronto; also "Remember dead," Telegram, 11 Nov. 1922. A surviving marker is inscribed, "This stone was / erected by / Jeremiah Lehene / Searg't IB 16th Reg. / In Memory of / his daughter / Ellen / Who Died / Feb. 16, 1865: / Ae. 1 yr. & 2 mo's. / Hark they whisper angels say(??) / Little sister's gone away." A notice on 12 Nov. 1864 announcing the death of Charles Henry, second son of Capt. George Leslie, R.A., aged six years and nearly four months, appeared in The Globe, 14 Nov. 1864, p. 2, c. 9. The surviving marker is illegible except for the boy's first two names, but before 1970 when the markers were moved into the present configuration it was located in the "West" or Officer's plot. 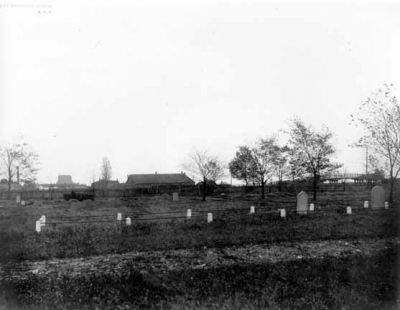 Fred G. Griffin, "Old Soldiers in a Neglected Corner, A Military Cemetery Crushed by City," Star Weekly, 29 Oct. 1921, p. 9, c. 2-4; "Remember Dead of 1812," Telegram, 11 Nov. 1922. "Landmarks of Toronto: the Military Cemeteries," Telegram, 4 Oct. 1888; "Remember dead, " Telegram, 11 Nov. 1922. A surviving marker is inscribed, "Sacred / to the Memory of / Walter Toronto [Lewis]." PRO: WO 10/250, Quarterly Returns for "D" Batt., 4th Brigade, R.A. PRO, WO 12/5937, Quarterly Returns for 47th Regt. of Foot; Globe, 9 Nov. 1865, p. 2, c. 5; ibid., 10 Nov. 1865, p. 2, c. 5; Leader, 9 Nov. 1865, p. 2, c. 6. Telegram, 27 Oct. 1893, p. 2, c. 5. A surviving marker is inscribed, "In Memory of / Lce. Corp'l / Donald McDonald / Royal Regiment / of Canadian Infantry / Born 24th Sep. 1863 / Died 26 Oct. 1893 / Erected by the Officers / of his Corps in Recognition of his long and faithful / service in the Officers' Mess." PRO: WO 10/2606, Quarterly Returns, 5th Batt., 10th Brigade, R.A. Also NAC, RG 8, C-2642, v. 74, p. 107. It appears that either John McFee or Henry Smith was the unnamed Royal Artilleryman who died in the quarter ending 31 Mar. 1864, as reported by George C. Williams, Chaplain to the Forces at Toronto. PRO, WO 12/1132, Quarterly Returns for 13th Hussars. A surviving marker is inscribed, "Sacred / To the Memory of / Trumpeter [James McMahon] / 13th Hussars / Died May 23, 1868 / Aged . . ."
PRO: WO 10/2606, Quarterly Returns for 5th Batt., 10th Brigade, R.A. Also, "Remember dead," Telegram, 1922, where the date of death is given in error as 1862. PRO: WO 10/2511, Quarterly Returns, "H" Batt., 4th Brigade, R.A. PRO: WO 12/1132, Quarterly Returns for 13th Hussars; ADTA, Parish records of St. John the Evangelist, Toronto, military death reports, 1867-69; Globe, 7 July 1868, p. 2, c. 4. In 1888 Robertson reported seeing a small marker or footstone inscribed "G.M." that may have been related but does not survive. PRO: WO 12/1131, Quarterly Returns for 13th Hussars. A surviving marker is inscribed, "Sacred / to the Memory of / Private George Miller / 13th Hussars: / Who Departed this life / Jan. 1st 1868. / Aged 30 years." It bears the stonecarver's name, N.L. Steiner. The footstone inscribed "G.M." (See endnote 58) may be related. PRO: WO 12/4626, Quarterly Returns for 30th Regt. of Foot; Globe, 25 August 1863, p. 2, c. 7. PRO: WO 12/4552, Quarterly Returns for 29th Regt. of Infantry. Mulcahy's own 17th regiment, which departed from Toronto on 13 May 1868, must have left him behind on account of his health. A surviving marker is inscribed, "In Memory / of / Harriet Isabella, / daughter of / Sup'r. B'k. Serjt. Ormsby / who died / 26 March, 1870 / Aged 6 years, / 11 months & 10 days." "Remember dead," Telegram, 1922. As late as 1953 McGinnis was able to document a marker inscribed, "In memory of Minnie daughter of Thomas Ormsby who died Sept. 16, 1866, aged 2 months 12 days." The marker does not survive in the cemetery today. Telegram, 28 August 1899, p. 5, c. 1; Star 28 August 1899, p. 2, c. 4. A surviving marker is inscribed, "Erected / by his comrades / in / Memory of / Hugh Owen / Royal Canadian Dragoons / Accidentally drowned / Aug. 26 1899." Globe, 7 Sept. 1866, p. 2, c. 4. Apparently Rattle jumped off the vessel Kingston into Lake Ontario near Port Hope. A surviving marker in the cemetery is inscribed, "In Memory of / John Manley Rattle / M.A. Christ Church, Oxford / Deputy Assistant Commissary / General / Who was acc[identally dr]owned / at [Port Hope] [C]anada / on the 3rd Sept  / Aged 39 years / His brother officers in Canada / regretting his loss have thus / marked his last earthly / resting place." OA, RG 80-4, Registration of Births, #046873 (1889); ibid. RG 80-10, Register of Deaths, #021534 (1892); also "Remember dead," Telegram, 1922. PRO: WO 10/2509, Quarterly Returns, "G" Batt., 4th Brigade, R.A.
"Landmarks of Toronto: The Military Cemeteries," Telegram, 4 Oct. 1888; "Remember dead" Telegram, 1922. Rachel Ross, a coloured woman, was the Commanding Officer's cook and the wife of Serj-Maj William Ross, 4th Artillery. PRO: WO 12/3373, Quarterly Returns for 16th Regt. of Foot; Globe, 26 Apr. 1864, p. 2, c. 6; Irish Canadian, 27 Apr. 1864. Griffin, Star Weekly, 29 Oct. 1921; also "Remember dead," Telegram, 1922. Griffin says Simpson was a Crimean War veteran who fought at Alma, Inkerman and Sebastopol. Therefore, he must have been older than age 28 when he died in 1875, as alleged by The Telegram. In 1921 a marker was noted that was inscribed in part, "He was a brave soldier and a kind husband." It may be the marker surviving today on which can be read, "This stone erected . . . /his bereaved . . ."
PRO: WO 12/1131, Quarterly Returns for 13th Hussars; Globe, 24 Jul. 1867, p. 2, c. 6; ibid., 25 Jul. 1867, p. 2, c. 5-6. A surviving marker is inscribed, "Sacred / to the Memory of / Corporal John Smeeton, / 13th Hussars. / Who was accidentally drowned / in Lake Ontario on the / 23rd July, 1867, Aged 30 years. / This stone erected by the Officers of the Regiment as a / Mark of respect for his long / And faithful services." It bears the name of the stonemason Pearse. "Remember Dead of 1812," Telegram, 11 Nov 1922. Her grave is located on the 1918 plan, and 1866 is noted as the year of death. PRO: WO 10/2606, Quarterly Returns, 5th Batt., 10th Brigade, R.A. Also NAC, RG 8, C-2642, v. 74, p. 107. It appears that either Henry Smith or John McFee was the unnamed Royal Artilleryman who died in the quarter ending 31 Mar. 1864, as reported by George C. Williams, Chaplain to the Forces at Toronto. "Remember dead," Telegram, 11 Nov 1922. Her grave is located on the 1918 plan. His grave is located on the 1918 plan, but no year of death is noted. In "Remember dead," Telegram, 1922, a Major John Smith was reported to be among those whose markers were still standing. Since Smith's marker did not stand within the officers' plot in 1918, however, he is unlikely to have been a Major. The stone may have been misread. PRO: WO 10/2509, Quarterly Returns, "H" Batt., 4th Brigade, R.A. Also Globe, 27 Dec. 1867, p. 2, c. 4. Smith was found dead in his bed. PRO: WO 10/2506, Quarterly Returns for "D" Batt., 4th Brigade, R.A. See also Daily Telegraph, 17 October 1866, p. 2, c. 7; Globe, 18 Oct. 1866, p. 2, c. 5. The newspapers reported his name in error as James Sidrich. Globe, 10 Sept 1864, p. 2, c. 8. A surviving marker is inscribed, "In / Sacred Memory of / [John Moira] McLean Sutherland /"
PRO: WO 10/2511, Quarterly Returns, "F" Batt., 4th Brigade, R.A.
"Landmarks of Toronto: The Military Cemeteries," Telegram, 4 Oct. 1888. PRO: WO 12/ 3373, Quarterly Returns, 16th Regt. of Foot. PRO: WO 12/5938, Quarterly Returns for 47th Regt. of Foot; Daily Telegraph, 3 August 1866, p. 3, c. 1; Globe, 4 August 1866, p. 2, c. 8. The Globe says Travers was buried in the Catholic cemetery; presumably the Catholic portion of the military burying ground was meant. PRO: WO 12/4626, Quarterly Returns for 30th Regt. of Foot; Globe, 8 July 1863, p. 2, c. 5; ibid., 9 July 1863, p. 2, c. 5; Fred G. Griffin, "Old Soldiers in a Neglected Corner," Star Weekly, 29 Oct. 1921, p. 9, il. A surviving marker is inscribed, "Sacred / To the Memory of / James Walsh / Private in [H.M. 30th Regiment] of Foot / He was alone and drowned in the Harbour / 7 July 1863 / in the [25 / 26] year of his age [illeg. lines] / Take heed, watch and pray / for ye know not when the time / is. Mark XIII, 33." It bears the name of the stonecarver, [N.L.] Steiner. There is also a surviving footstone inscribed "J.W." PRO: WO 12/4553, Quarterly Returns for 29th Regt. of Infantry. A surviving marker is inscribed, "In memory of / Our Dear Little / William Alexander / Son of Wm. & Eliz'th Wood / Born in Halifax, N.S. / June 14, 1866 / Died April 1, 1867. / [illeg. 4-line verse]."